This small collection of five interconnected stories was a fabulous discovery. 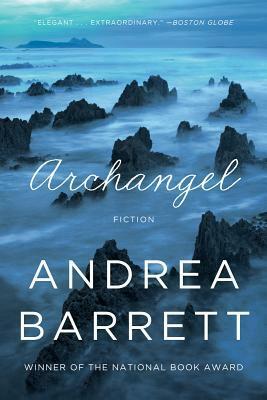 National Book Award winning author Andrea Barrett is now a professor of English at Williams College, but graduated from college with a degree in biology. With these stories she uses these interests and experience to brilliantly and lovingly explore the process of scientific investigation and discovery and its effects on society’s view of the universe and the ties between individuals. The five stories non-chronologically span from the late 1800s through the early 1900s, linked both by science and character relations, covering monumental discoveries of evolution, genetics, Einstein’s relativity, and particle physics over the sociopolitical historical backdrops of each ear. They therefore will appeal to readers that appreciate fiction that is historical, scientific, literary, or (like me) all three. As a scientist I was immediately struck by how realistically Barrett portrays the practice of science. I often think that the genre term science fiction is better dubbed speculative fiction, or even technological fiction. Rarely is SF concerned with the actual process of science and its social implications, rather it becomes about future applications of science and their effects on life. I’ve always looked for science fiction that was realistically just that: fictionalized accounts of doing current or past science. In Archangel, the characters and stories themselves are infused with a sense of excitement, wonder, and impatience, yet also a bit of skepticism, doubt/uncertainty, and inadequacy. Barrett touches upon the differences between science and pseudoscience and the sometimes hazy divide that can appear between the two. Ultimately, science is a social activity, it is not a cool Vulcanesque rationality divorced from humanity, culture, and relationships. Barrett’s recognition and exploration of this is what wraps the historic and scientific foundation of her writing with a delicate literary silk. The characters of Archangel exist in periods of world-shifting ideas that call into question the beliefs and assumptions of individuals and society. They must struggle with their own preconceptions and the expectations of others as they are confronted with new evidence and models of the universe. This is difficult when one has built their reputation on alternate ideas, when one’s respected and accomplished mentor is falling on the wrong side of scientific understanding/history, or when family members or the national culture have deeply seeded convictions that stand in opposition to what rational evidence presents to oneself. Despite its historical nature, Archangel thus has significant relevance to even our current times: the rights of women, anti-science politics, alteration of the environment, and hope in a better, prosperous, and enlightened future. By linking the stories through time Barrett is able to explore shifting attitudes through changing generations and individual lifespans. These are captivating stories that stand on rich character and solid foundations of setting rather than plot, and Barrett’s writing flows pleasingly with artistry without being bogged down with academic or haughty pretentiousness. I’m really thankful to have won the giveaway for this and am looking forward to discovering Barrett’s past work and seeing what is to come. Disclaimer: I received a free advanced reading copy of this from the publisher via Goodreads’ First-reads giveaway program in exchange for an honest review.